It has only been six days since Hank arrived in our home and he is already changing so much. He is taller and sturdier. I swear when he got up this morning it looked like his hind legs grew but his front ones didn't. He looked like he was going to tip over. Then after a dentist appointment for Little Buddy and a few errands I returned home to see that his legs had evened out. He is a snuggler, well when he isn't biting us all and running around like a mad man. These craptastic photos are the best I could get today. We are in my office that does not get the best light. Hank is usually a blur or activity or has knocked himself out with exhaustion. In those rare moments of calm I run around like crazy getting things done. Little Buddy looks like a giant right now but will soon be the smallest again. These two are inseparable, Little Buddy is always on the floor being jumped on and either laughing or screaming. I tell him to get up on the sofa and away from Hank but he just goes back for more. I am sure Hank thinks Little Buddy is a puppy and likes to be nipped at, have his shirt pulled or to be jumped on in a surprise attack. Hopefully there will be more photo opportunities this weekend, as for now I am just enjoying that he is still. Really who cares about a wrap when there are puppy photos to look at but here I go anyway. I finished this the afternoon Hank arrived. And as you can guess not one stitch has been made since that time. It is all work, Little Buddy, and Hank 24/7. Once again I am calling this the Kaleidoscope Wrap. The circles are made with Verdant Gryphon Traveller, in the color Big Rock Candy Mountain, 2 skeins used for a total 560 yards.. The deep gold border is from Amano Yarns, AWA in the color Q'olle Flower, just over 2 skeins used for approximately, 700 yards. A total of 1,260 yards for this wrap. I used a size K hook to help make the fabric drape a bit more that using the hook size recommended by the yarn manufactures. The pattern was sort of my own even though I am sure you could find hundreds of motifs just like this on Ravelry. There are 44 circles surrounded by a two row border, 4 motifs per row. The motifs were joined as I went along and at the end I did a simple double crochet granny border to surround the whole thing. Nothing fancy as I want this to be simple yet I hope elegant. I hope I don't look like I am wearing a blanket when and if I ever wear it. The Verdant Gryphon yarn was a gift to me and the other I purchased at the end of last year for this project. A week ago I needed to buy one more skein to finish it off. I went into the yarn store and went directly to this yarn and did not allow myself to look around at anything else. I am determined to get more done with my stash this year. It shrank considerably the last two years and is still manageable but I would still like to work on it. Okay computer time is over, we need to go outside, to do our business and go back in the crate before I go get Little Buddy from school in time to get all of his therapies. Have a great weekend my friends. When I saw your heading I thought Hank had got hold of the Wrap and spoiled it!!! great relief I was wrong.What a partnership/friendship Hank and Little Buddy are going to be. Your wrap is beautiful! Hank is adorable too!! I love that his name is Hank and that your family had no idea about the yarn connection. 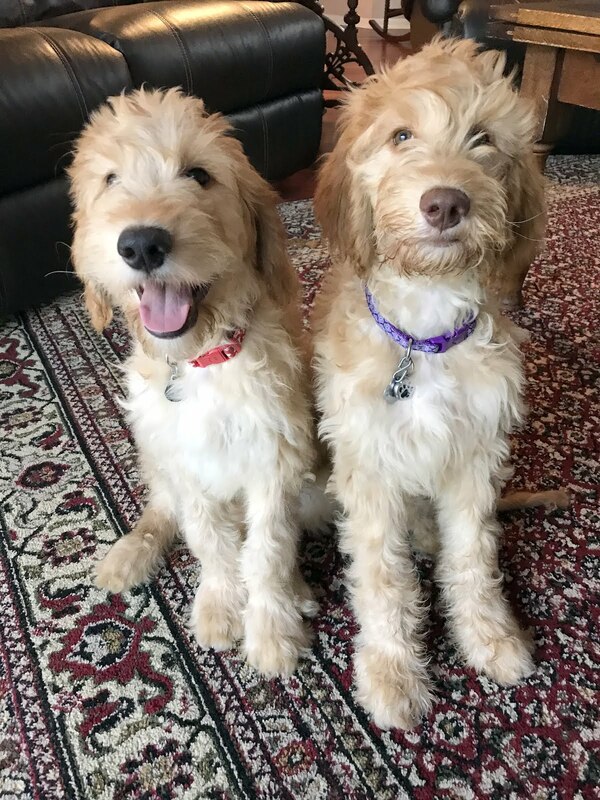 It will be wonderful for Buddy and Hank to grow up together won't it, and I am sure that Hank will do great things for Buddy and vice versa - as well as great things for you and the rest of your family too. Always a joy to read your news! Puppy pix!!!!!! He is just so adorable-Bambi legs and all. Love that wrap. It's really very vintage looking. Perfect for a fancy afternoon tea. Goodness, can you tell I've been binge watching The Crown? Meant to comment earlier about Hank he is adorable and will be the most loved pup around. Shawl is lovely. I'm sure he brings a lot of joy after a hard day, even if they are work, their little personalities negate all that. Hank and Little Buddy, two little ones growing up together is going to stay in my mind and love that you are sharing their photos. Thanks for showing your finished Kaleidoscope Wrap, rich colors. Hank is cute and looks like he wore himself out! Pups grow fast, just like kittens. Nice wrap and well done! I'm off to finish another book on Shutterfly that's free. Working on our anniversary celebration. found photos on my phone I need to put in it before it's all finished. Have a good weekend and be blessed! Wow, he is just adorable and changing already. They grow so quickly and form wonderful relationships so quickly with the young ones. Little Buddy and Hank will become firm friends. Love the wrap, a wonderful creation for those cooler evenings. The shawl is a wonderful accomplishment considering how busy you've been! So cuddly warm , too, is appropriate now! And the puppy is adorable! Your wrap is just gorgeous, but may I be honest? I find Hank even more adorable! Just look at that face. He could barely keep his eyes open but was giving it a valiant try. I just love puppies. Even puppy breath! Ha! I can just see him and LB in my minds eye playing together. A little boys dream. I am so looking forward to watching them both grew up together. Have a lovely weekend my friend. Your wrap is beautiful, and the colors are perfect. Love those Hank photos, and it's so fun to see LB with him. Oh those puppy days and those sharp puppy teeth!!! I'm sure he will calm down quickly. He looks like a very BRIGHT puppy! Your wrap is beautiful. That will be perfect for the autumn. Nothing could be as precious as little Buddy, but Hank is a close second! I'm in love! And your wrap is gorgeous! Awww, I don't think I'll ever have enough of Hank photos, such a cutie and yes, he does look to have grown already from the last lot of photos. The wrap is lovely, such pretty colours. You are responsible for all the puppy/kitten, dog foster etc thoughts that I've had all week! Youmake me think that if yOU can find time for a puppy, I'm just being lazy. Such joy they bring. Maybe I'll go to the local shelter tomorrow and bring a donation so I can just peek at kittens. We are at capacity here. I love your shawl. Happy weekend. THank you for the posts at such a busy time in your life!! The colors of your wrap are just incredible! Isn't it funny how quickly puppies grow and not sequentially either. He's adorable! Don't you wish they could just stay puppies for a while and not grow so fast. Enjoy every crazy minute while it lasts and keep posting pics cuz you've got a lot puppy lovers out here living vicariously through you right now. ;-) Nice work on the wrap too! Hank is such a great addition to your family! Love all the photos of him. You are going to be very busy for a while! A little boy and puppy...few things are as cute or as exhausting, especially when you have both of them. All this frantic work will be worth it. I have a feeling that this is the beginning of a beautiful relationship! Seeing these photos of Hank makes my heart melt! I can perfectly imagine him being wild and playful as my sister has got 2 dogs who are grown up but still very active! The wrap is just pretty! I love the summery colors! That is great Hank is growing well and is a healthy puppy. I love your wrap! very nice and love the colors. It doesn't look like a blanket because of the shape you have made. It is too thin and long to be mistaken for a blanket. It is pretty obvious to me that it is a wrap and the colours are lovely. I look forward to seeing you wearing it. Nice to read! And what e beautiful kaleidoscope wrap!